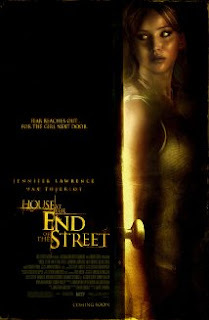 Arriving hot off her run in The Hunger Games blockbuster and Silver Linings Playbook, Jennifer Lawrence took a slight detour in the suspense/thriller House At The End Of The Street. Lets not get this mixed up with a horror or teen slasher movie, like some dissatisfied reviwers did. Instead this story takes us through a relatively formula plot of mystery and suspense. Some critics complained of the lack of jumps and the slow pace. I rather appreciated the pace. Too often in these type of stories viewers protest the inelixible actions of the characters (like, 'Why would she go out into the woods alone'). A slower methodical plot allows for the characters to develop organically and give the viewer insights into the motivations of their actions. For example, this pace allowed us to understand why our heroine would be curious about her neighbor and seek out his attention. Another reviewer proclaimed that Jennifer's gifted acting saved the movie only because she abandoned it. Not quite sure what they were getting at, but I will give it a go. I think that they were crediting her for having the professional insights not to over act the role in scenes that would have otherwise crumbled under less gifted actors. I think Jennifer did an adminarble job showcasing just enough instincts so as to not render the script too hokey and making the relationship with next door neighbor (played with great skill by Max Thieriot) believable. Looking forward to seeing more of him in the future. Reminded me of a young Ryan Gossling. Their chemistry and innocent exploratory interactions is probably the highlight of the movie. Don't misinterpret my positive comments as I can only give a moderate recommendation as the story did have holes and timing out at 101 minutes it got out when the getting was good. I could not have withstood another 20 minutes. All in all, a diversion for Jennifer, who along with the serious drama Silver Linings Playbook demonstrates that she is a versatile actress tackling suspense, action and drama.